Everybody knows that your search engine rankings directly affect your search engine traffic, but what is less well known is exactly how beneficial achieving a certain ranking will be. Ranking 1st for competitive keywords is the perfect outcome of any SEO campaign, but why rank 1? 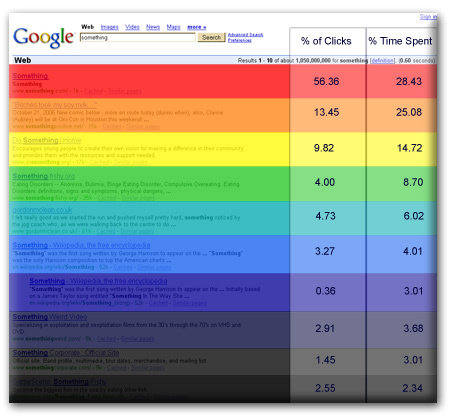 Put simply, the website at rank 1 gets the majority of the search traffic for that keyword. Following is the distribution of clicks for the top 10 rankings. As you can see, rank 1 should always be your target. However, notice that rank 5 has more clicks than rank 4; this is probably not because of the placement but because of bad copy, people most likely prefer the title and description of the page at rank 5 over that of the page at rank 4. So not only should you target rank 1 but you should also make sure to optimize your titles and descriptions to be interested and to make people want to read more. 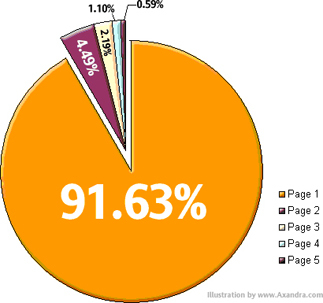 Now that you know the click distribution for ranks 1 to 10 lets take a look at the click distribution between pages. As you can see in this image, reaching the 1st page is of utmost importance since the amount of people to reach page 2 are minimal and the amount to reach page 3 are even lower. To put these figures into a different perspective I will put them into a table. The following is the amount of clicks you would receive at each ranking for a keyword which gets 10,000 searches per day.